cut down and the peat land swamps are drained. UCS states, “Destruction of these ecosystems devastates endangered species habitats and contributes to climate change by releasing global warming emissions into the atmosphere….Tropical deforestation…accounts for about ten percent of annual carbon dioxide emissions”. Not only is palm oil production bad for our climate and animal habitat, palm oil is bad for us. It is mostly saturated fat, a food we should avoid for heart health. Indonesia and Malaysia produce about 85% of the world’s palm oil, which comprises about a third of all vegetable oil produced globally. Orangutans, tigers, rhinoceros, elephants and tropical birds native to these countries face extinction as their habit disappears in cleared areas. Sometimes the forests are seized from indigenous people and forced labor causes many human rights abuses. Widespread burning of tropical forests causes an unhealthy haze that is spreading throughout Southeast Asia, resulting in unhealthy impacts to the residents. The public has begun to demand deforestation-free and peatland-free palm oil. Some companies have made commitments, at least on paper, to try to source their palm oil more responsibly. UCS wrote their first report on this problem in 2014. In 2015, they produced a scorecard, which rated forty companies on their commitment to responsibly sourcing their palm oil. As a result, some companies have already made the transition, and some others have begun to respond to consumer pressure, and have made commitments to transition to responsibly sourced palm oil by 2021. The UCS scorecard shows that in the packaged food industry, Nestle, Dannon, Kellogg’s, ConAgra (Act 11 Popcorn, Marie Callender’s), Unilever (Ben and Jerry’s, Popsicle, Slimfast), Pepsico, and General Mills have made a strong commitment to responsibly source their palm oil. Kraft has made no commitment. In the Personal care industry, Colgate, Henkel (Dial, Right Guard), P&G, L’Oreal, and Reckitt Benckiser (Veet, Clearasil) have made a strong commitment, while Estee Lauder, Avon and Clorox, which makes Burt’s Bees, have made little or no commitment. In fast food companies, only Dunkin Donuts (including Baskin-Robbins) has made a strong commitment to protection. Among grocery store brands, only Safeway Organic, Safeway Select, and Safeway Care have made a strong commitment. You can see the complete scorecard at www.ucsusa.com. I am going to try to read ingredients and avoid palm oil altogether, especially in processed food, since I don’t need the saturated fat. And I can be an informed consumer and only buy products produced by companies that have made a commitment to protect the environment. Consumer pressure does work. I guess that means I will have to find a substitute for Burt’s Bees products. Many thanks to all flora and fauna reporters for the month of May. Please send reports by June 26 for inclusion in next month’s column. You can write me at 10 Chamberlain Rd., call me at 692-3907, or e-mail me at MarianCHarman@verizon.net. Dot Mooney, Monadnock Dr. April 22, a bear paid a visit to my feeders overnight–no real damage, just made a mess. Two cute chipping sparrows on deck. April 23, under Parkhurst power lines: bright dandelions blooming, soft leaves of mullein emerging. Nearby, chickadees, blue jays, goldfinches, pine warbler, chipping sparrow, titmice, downy woodpecker, white-breasted nuthatch, two towhees. Near my door step, same birds as well as doves, phoebe, flicker, grackles, red-bellied woodpecker and one late junco. A turkey hen limping around on back lawn. April 28, Howard Rd. wetland water deeper now. A few turtles in high sunny spots, small muskrat swam quietly by, heard a Canada goose and first catbird this year. Watched several tree swallows dipping through the air low over the water, garlic mustard in bloom. Debbie Prato, Hayrick Lane. April 30, two cottontail rabbits, Baltimore orioles, white-crowned sparrows, male rose-breasted grosbeak, catbirds. Marian/Bill Harman, Chamberlain Rd. April 30, first oriole and first catbird, here–so early! Ginger Dries, Sherwood Dr. May 1, the bear hit the feeders again, nothing since. May 5, first hummers. May 22, a lone deer on the hill. May 24, female turkey under feeders. Also, an American redstart in a shrub in the yard. We have had Baltimore orioles, rose-breasted grosbeaks, catbird nest in the rose bush, robin nest in the cherry, sparrows nesting in the rain spouts. The wren is singing everywhere. Two or three bunnies, lots of squirrels. rose bush, robin nest in the cherry, house sparrows nesting in the rainspouts, three bunnies, lots of squirrels. May 24, American redstart in yard. Debbie Prato, Hayrick Lane. May 2, Canada geese, mallards, male ruby-throated hummingbird. May 11, tree swallows, mockingbird. May 15, garter snake, hummingbirds, cottontail rabbit, goldfinches, house finches, chickadees, tufted titmice. May 22, deer. Emmet land: ovenbird, goldfinch, titmouse, chickadee, chipping sparrow, pine warbler heard, red-winged blackbirds, common yellowthroat, barred owl, robin, catbird, mallards, Canada geese, great blue heron, great egret (! ), tree swallow, cardinal, blue jay, grackle, downy woodpecker, red-bellied woodpecker, green frogs and salamander eggs in the vernal pool, red squirrel, starflower, Canada mayflower, wood anemone, blueberry all blooming. May 17, great-crested flycatcher arrived. May 24, oriole singing, wood thrush singing, catbirds, scarlet tanager singing, rose-breasted grosbeak singing. Bob Price, Stratton Hill Rd. May 3, hummingbirds arrived. May 4, pair of grosbeaks at feeder. Lisa Groves, Main St. May 6, turkey nesting right next to our garage at the top of a retaining wall. She’s alert and hisses when we come near, and we assume she’s already got eggs there…she’s laying in a patch of goldenrod/blue flag iris/peony. Nancy Bissell, North Main St. May 7. A dead turkey on the hill, and I was shocked to see vultures at it. Emily Teller, Texas Rd. May 10, phoebes are back. I love their mossy nests. Len Palmer, Trust Bird Walk at Emmet Land. 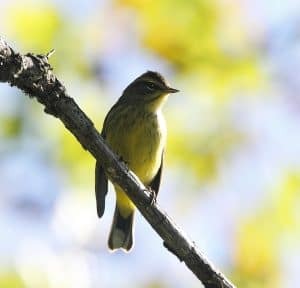 May 13, pine warbler, several ovenbirds, titmouse, chickadee, blue jay, robin, downy woodpecker, pileated woodpecker, several common yellowthroats, about four Baltimore orioles, pair of warbling vireos, red-winged blackbirds, cowbirds, grackles, Canada geese, spotted sandpiper, brown creeper, cardinal, goldfinches, starflower, wood anemone, marsh marigold, sarsaparilla all blooming. Elana Schreiber, at Main St. May 21. I saw a bobcat crossing the street from the Tom Paul trail to Town Hall. It was wonderful to see. Also, gray fox crossed Graniteville Rd. into town vegetable garden area. Cindy Franklin, Heywood Rd. May 23, black bear quite close to house, looked like a young adult. He had large yellow tags in both ears. Rosemarie Koester, Providence Rd. May report: two pairs of blue jays, one pair of cardinals, red-winged blackbirds male and female, grackles, goldfinch, house finch, chickadees, titmouse, rose-breasted grosbeak male, robins, downy woodpecker, hummingbirds showed up first week in May, hawk circling overhead, group of turkeys, two males courting a few females, plus the partially white turkey, several rabbits, squirrels, chipmunks (less than last year), skunk cabbage by the brook. Kirsten Collins, Hildreth St. May 24, a baby owl was rescued from the middle of Hildreth St. Two people picked it up and put it in the woods.